You may also have h2ope delivered to you through Beverage Universe. 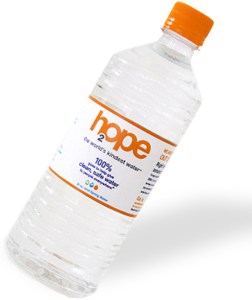 Make a difference by simply choosing h2ope The World's Kindest Water™ instead of some other brand! 100% of the proceeds from your purchase of goes to helping give clean, safe water to people everywhere! Make a difference by being an eco-friendly and stylish billboard to help stop the World Water Crisis. 100% of the proceeds from your purchase goes to help give clean, safe water to people everywhere©. Made from 100% organic cotton, printed with soy ink. The bottle stands when full, but when it's empty, you can roll , fold, or flatten it to easily go in your pocket, purse, backpack, briefcase – anywhere! A colorful carabiner lets you to attach wherever you like. Know who's bottle is whose by writing your name on the back. Made from ultra-durable, FDA-approved, BPA-free polymer. The inner layer is odor, taste, and stain resistant. Sustainable Packaging is printed using wind power on 100% post-consumer paper. Bottles ship flat so they take nearly 90% less space and use less fuel to transport than rigid water bottles. Make a difference by choosing collapsible! 100% of the proceeds from your purchase goes to helping give clean, safe water to people everywhere!